Chef Greg Christian and his featured colleagues are building cafeteria models that work for everyone and everything. 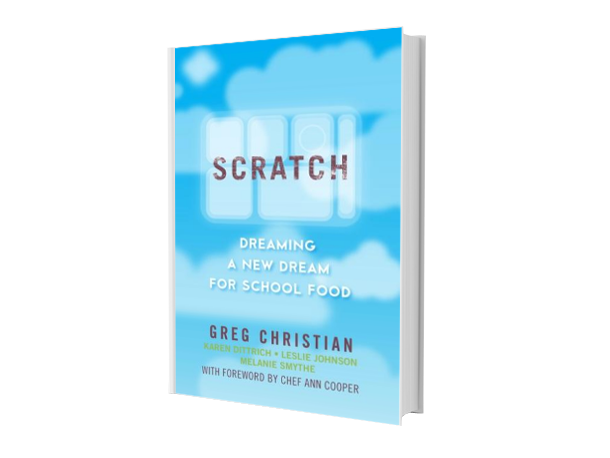 Greg will walk you through the steps to creating a scratch cooking model in an institutional kitchen. His inclusive process develops relationships with the farmers that produce fresh ingredients, meets USDA regulations, and balances a kitchen’s bottom line. By the end, you’ll see how close partnerships, trust, and teamwork can change the broken system of mass-producing school lunches. This book is your road map down a path of great change. It will take courage and involve risks, but in the end, you will know how to build a high-efficiency kitchen that produces high quality meals without taking a toll on the environment or the staff that dedicate their lives to feeding our country’s young people. One cafeteria at a time, we are dreaming a new dream. Scratch contributors are Karen Dittrich, Leslie Johnson, and Melanie Smythe, with a foreword by Chef Ann Cooper.